Plastic laminate toilet partitions use particleboard for the core with an outside layer of laminate by Formica or Wilsonart on all sides of a sheet. Moisture guard plastic laminate helps with delaminating, however, we do not recommend using these stalls in shower areas as this product will delaminate over time due to water. Partitions and Stalls has been a trusted name in the commercial toilet partition business for over 35 years. We’re eager to help with the configuration, selection, and purchase of plastic laminate toilet partitions. Global partition plastic laminate corner stalls for commercial use. Plastic laminate overhead braced floor mounted stalls are most often used. Standard stalls are 36" x 60"depth (26" door), Ada stalls are minimum 60" x 60" depth (36" door). All standard chrome hardware included. Doors can be either in or out swing. Up to 8 standard stalls total or 7 standard and 1 ada stall. To have an Ada stall you must select 1 Ada 24 x60, plus 1 standard stall for 1 complete 60 x 60 ada stall. To have an Ada stall & standard stall, you must select 2 standard stalls and 1 Ada stall 24x60. Plastic laminate Partitions ship in 5 business days. Global partitions plastic laminate free standing compartment stalls. Plastic laminate overhead braced floor mounted stalls are most common and used in commercial businesses. 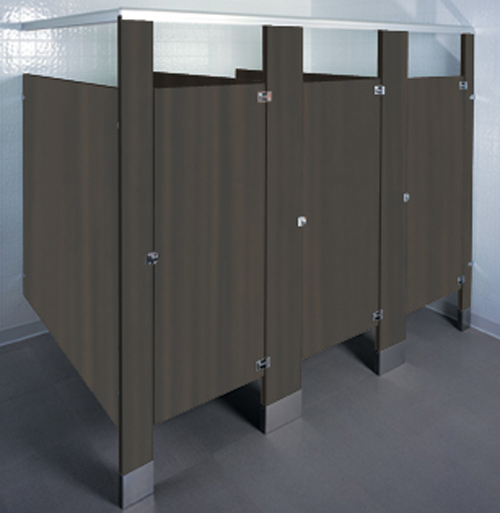 Standard stalls are 36" x 60" depth (26" door), Ada stall 60" x 60" depth (36" door). All standard chrome hardware included. Doors can be either in or out swing. Up to 8 standard stalls total or 7 standard and 1 ada stall. To have an Ada stall you must select 1 Ada 24 x 60, plus 1 standard stall for 1 complete 60 x 60 ada stall. To have an Ada stall & standard stall, you must select 2 standard stalls and 1 Ada stall 24x60. Plastic laminate Partitions ship in 5 business days. Accutec Plastic Laminate Corner Partitions are Fabricated from 45 pound density, resin impregnated particle board. The plastic laminate is glued to particle board with a non-toxic, water resistant adhesive under high pressure. Components are edge banded prior to face lamination to ensure moisture run off and vandal resistance. Not recommended for high moisture areas. Doors, panels, and urinal screens - 1" thick (uses 7/8" particle board) Pilasters - 1-1/4" thick (uses 1-1/8" particle board) Hardware - Gravity cam-action hinges permit door to remain at desired position when not in use. Hinges, strike and keeper bumper, slide latch and brackets are chromed plated alloy. Door can be lifted to allow emergency access. Installation instructions and all mounting hardware are supplied with each order. Ordering Online All plastic laminate partitions manufactured by Accu Tec manufacturing, see color chart below. Accutec partitions are located in California and ship in 2-3 business days. Accutec Plastic Laminate Free Standing Partitions are Fabricated from 45 pound density, resin impregnated particle board. The plastic laminate is glued to particle board with a non-toxic, water resistant adhesive under high pressure. Components are edge banded prior to face lamination to ensure moisture run off and vandal resistance. Not recommended for high moisture areas. Doors, panels, and urinal screens - 1" thick (uses 7/8" particle board) Pilasters - 1-1/4" thick (uses 1-1/8" particle board) Hardware - Gravity cam-action hinges permit door to remain at desired position when not in use. Hinges, strike and keeper bumper, slide latch and brackets are chromed plated alloy. Door can be lifted to allow emergency access. Installation instructions and all mounting hardware are supplied with each order. Ordering Online All plastic laminate partitions manufactured by Accu Tec manufacturing, see color chart below. Accutec partitions are located in California and ship in 2-3 business days. Accutec Plastic Laminate Alcove Partitions are great for churches, office buildings and commercial businesses. Plastic laminate overhead braced floor mounted alcove stalls include a 36" Ada door, 2 pilasters and panel to make up the difference. Doors can be either in or out swing. Accutec partitions are located in California and ship in 2-3 business days. All standard panel brackets and door kits included. Global partitions plastic laminate pilasters are for commercial use. All toilet partitions ship in 1 week, 2-4 days travel. The pilasters Include floor mounting hardware and stainless steel shoes and are 1-1/4" thick. Available for the following widths are available in 3- 24". The pilasters are for overhead braced units that use an aluminum headrail to brace the top of the pilasters and are 82" height. Ordering online all plastic laminate doors are Manufactured by Global partitions. All toilet partitions ship in 1 week, 2-4 days travel. Plastic laminate doors include hinges for 1-1/4" square edge pilaster and bumper keeper and surface mount slide bolt latch. Available for the following door opening widths 22-36 inch(actual door size is 3/8" narrower that the opening).